The Red Rock Canyon campground is located at 3293 Moenkopi Rd., Las Vegas, NV 89161. To get there from Clark County 215 Beltway west, take the Charleston Blvd. exit (exit #26) and head west. Drive 3.5 miles to Moenkopi Rd. Turn south on Moenkopi Rd. and drive for a mile (past the BLM Fire Station). Physical Address: Moenkopi Road, Las Vegas, Nevada 89161. Summer time might not be the best time to try to camp in southern Nevada but with mild fall and winter this campsite leaves a lot of options for those looking for an outdoor adventure. I spent much of early spring at Red Rock enjoying the facilities, the hiking, the vistas and yes the camping. This campground does accept reservations for group sites however individual sites are walk up first come first serve and with those mild weekends they do fill up quickly. Weekdays are suggested if you can make it out as it is a bit easier to get a site during those days. One thing most do not consider with camping at this location is the proximity to the Las Vegas strip and all the tourists which that includes. This campsite is coveted and many who wish to venture beyond the brights lights find themselves at this nationally acclaimed facility. 1- No cell servIce at the campground for any provIder, fact is unless you hike to the peaks you wIll not fInd any cell service for miles. 2- Campground sometimes appears full when in fact people are parking here instead of camping so do not get turned away without a quick once through the campground itself. 3- No hookups for electrIcal or water at individual sItes. If you must have power you will want to consider alternative sources. RV campers as well as tent campers are able to stay at thIs locatIon however It does sway a bIt more toward tent campIng In way of spacing and availabilIty. Cost to camp are $15 for single tent campers like myself. ThIs Includes a pIcnIc table and awning but more Importantly proximity to the park itself. Most don’t inquire about stay length but for a blogger lIke myself I had to know and elected to ask, because who wouldnt want the best vIews In the area as long as possIble! 14 days!! This offers a nice and quick getaway from the city of Las Vegas. You get a better view of tge nightsky and its quiet. Sites are nice, especially if you get one with a covered picnic table to escape the sun/heat. Close to Las Vegas Airport and Strip but you'd never know it! On our last night of a week long trip to Utah and Arizona, with an early flight out the next morning, this campground was perfect. It's only about 40 minutes form the Las Vegas Airport but feels like you are forever away from the hustle and bustle of the strip. Each site has a set place for the tent so you aren't trying to find a flat piece of ground for your tent as one is already provided. Although we only used this as a stop over on our last night, we will be back! 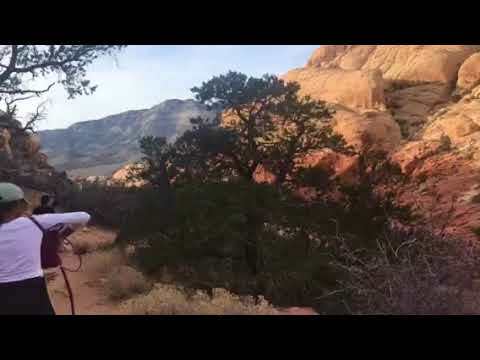 There is so much good hiking right there in Red Rock Canyon. Wish we would have had more time to explore! Climbers galore or maybe just seeing the sights, Red Rocks and its campground is a sight to see. Red Rocks Campground in the cold season is rock climbers heaven! Jeremy and I decided to visit Red Rocks Conservation Area to go, you guessed it, rock climbing. This would be our first visit to this area so after seaching the area for campgrounds on [the dyrt](http://the dyrt ) we came across this one. We knew we would be testing our luck with camping with it being New Years Weekend with limited availability. However, we were able to ask somoene that was leaving if we could sneak in behind them. He was a climber and was super kind. Let us pull into the campspot right then and there a few hours before he planned on leaving. Everyone in the campground, aka the climbing comunity, is super kind and outgoing. The vibe during this season is a laid back yet pumped up. Bathrooms were clean for them being drop toliets. Had a solar light in them which was a nice change for those types of bathrooms. They stayed well stocked thanks to the camp hosts. Just outside the bathrooms was running water with drinking water. The campsites were set up amazingly! Most sites, like ours, had a patio cover, which was paired with a metal picnic table. A fire ring was set up with a grill on it as well as two benches to be able to sit at the fire. There was a seperate grill if you choose to make food that way. Just past that was the "tent pad". Since this is rocky terrain they set up what almost looks like a litter box of sand for your tents to be set up, rock free! Each site accomidates up to 2 cars and however many tents you can squeeze into the tent pad. For everything you get at this site it is only $15 a night for each campsite. They are first come first serve. There is an RV section seperate to the rest of the campground, we did not see pricing or the sites for these because they are down in another section. They also offer "walk-up" sites. You park and can set up in a more condensed area that is strictly for tents. There are a lots of options for this campground! As a Ranger for The Dyrt, I get products to test from time to time - today I am testing Boost Oxygen! Our whole reason to going for Red Rocks was to go rock climbing! An amazing place to test out Boost Oxygen's new medium size as well as the grapefruit flavored one. We took the medium size natural flavor with us the first day out on the rocks. It was the perfect size to throw into our packed down climbing bag and gear. Packing for a day out on the rocks requires climbing gear ( harness, chalk, rope, grigri, quickdraws, and sometimes more), snack, water, and of course my Boost Oxygen. Following the new perfect size, the mouth piece has been condensed from large size. Upon using it for the first time I immediately fel in love with the smaller mouth size. It still cups your entire mouth, but it has a snug fit. When breathing in I felt like I was getting every molecule of the oxygen. Though I will say, Jeremy still enjoys the bigger size! The second day we used the grapefruit flavored one for the first time. I was hesitant on this flavor just because it seemed a little different compared to the other flavors offered. However, I was pleasantly surprised. It wasn't overly citrus-y, but rather light and complimentary. Coming down and off the wall it was nice to grab my Boost Grapefruit and just take a few deep breathe with it and feel back at 100% to be able to jump back on the wall. It helped me relax my pumped muscles and focus on my next climb ahead of me. I always recommend Boost Oxygen to anyone that is looking to push there limits to the next high. Boost gives you that umf that you need to get to the next level in your athletic lifestyle. I make several trips out here each year and can't say enough good things. The group sites are large and have nice big pavilions at each site with picnic tables and fire pits. Each site has walkways leading to platforms for setting up a number of tents. This area Is notorious for having moderate to high winds so be ready to stake out all corners including the vestibules. Winds here are predominantly out of the east but can switch out of the west overnight. BE LIBERAL WITH TENT STAKES! Each site has running water, trash bins and a pit toilet. Close proximity to Red Rock Canyon, Hiking Trails and Climbing Routes. On the edge of beautiful Red Rock Canyon National Conservation Area. Too bad it's not closer to the canyon, but this is as good as it gets. Clean restrooms, clean sites, modern shade covers with concrete pads & newer picnic tables. Don't come here for the camping, get out and enjoy Red Rock Canyon, one of Las Vegas' best outdoor attractions. Red rocks does NOT have a lot of camping options. It's basically here, or something illegal, or something 45 minutes away (Lovell Canyon). Staying on the strip, or an airbnb in summerlin are also good options. But I usually come here for short climbing trips and do enjoy the camping experience. I think both times I was able to snag a reservation, I had to book a group site, as they are usually the last ones left. The minimum is 10 people. However I only had a group of 8. This wasn't a problem for us, but I don't know how strict they could be if they wanted. I love how they have plenty of tables, and benches around the fire pit! BUT "fire season" is from May-October and they prohibit fires of any kind.